IF YOU HAVE YET TO BE INTRO-DUCED TO THE BAND, it is made up of three Colombians, girls from Hong Kong and Ireland and, says their publicity machine, "some dodgy South London bloke in a flat cap"! So you can see immediately that you're not dealing with your average band! It's not easy to pigeonhole Morton Valence. Their unique brand of music could be described as "skittery, chaotic disco-pop". But would you actually describe darts as a sport? Come up with one word and you'll quickly be fishing around for another. Enthusiastic, energetic and with a great sense of humour, Morton Valence were thrilled when Fopp Record Stores chose them as winners of their 2006 Award for New Music, hosted by Eddy Temple-Morris. Unfortunately, the band heard that Fopp went into liquidation and we have been asked to tell you that this is entirely coincidental and that Morton Valence accept no responsibility! Ahhh! Sailors comes complete with remixes from Lord Barringtone, formerly of Clor fame, and has been described by Sounds XP as "brilliant electro-pop" and from Artrocker comes a warning that "those synths mesmerize with gusto". We get the picture. title with a means of transport by which the titular figures travel. The band's management describe this move as "cunning". Having shared the stage with Belle & Sebastian in Berlin, British Sea Power in a cave (! ), Misty's Big Adventure and The Longcut  in normal venues  Morton Valence are looking forward to a debut album in the New Year (2008). And we here at MotorBar are looking forward to seeing Sailors rule the sound-waves! 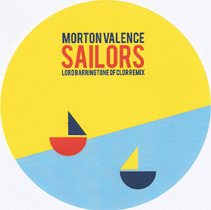  Morton Valence released their debut single CD Sailors on 5 November (2007) from Cheap Date Records.